R. R. Patil was 57 years, 6 months	& 0 day old age. 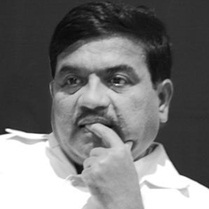 R. R. Patil, often referred as “Aba”, was born on 16-08-1957 in the Sangli district of Maharashtra, India. He obtained his B.A. as well as LLB degree from the famous Shantiniketan College of Sangli. He was fluent in speaking Hindi, Marathi, and English. R. R. Patil entered politics at a very young age and was a representative of SangliZillahParishad for 11 long years 1979 to 1990. After which, he was handed an MLA ticket and he got elected for consecutive three terms from 1990 to 2004, fromSangli district. Patil soon became the strong face of the Indian Congress Party in the Maharashtra legislative assembly. In 2004, he was made the Deputy CM of Maharashtra. He was the chief whip of the Indian National Congress Party and NCP’s alliance in Maharashtra Legislative Assembly. Prior to deputy CM, he also served as the Home Minister of Maharashtra in his previous term. As soon as he took charge of Home Ministry, he raised his voice strongly againstNaxalActiviteswhich were going on in District Gadchiroli. Due to some unethical comments that he made after 2008 Mumbai Terror Attack, he himself stepped down as the Home Minister citing outrage in the people. R. R. Patil died on 16-02-2015 in Bandra, Mumbai, Maharashtra, India after a long fight with oral cancer. He was married to Patil Suman. He had a son named Rohit Patil, and two daughters named Smita Patil and Supriya Patil. He had two brothers named Rajaram Ramrao Patil and Suresh Patil.